Yes, I am somehow thin and yes, I have done a marathon before and yes, I can walk 80 miles in one day over brutal concrete roads. This came not as a gift from somewhere, nor do I think that somebody giftet my body the ability to do this. It did not come overnight, rather it was a process of over two years by now. The last serious job I did was in politics. I had to take the train to Bern to my office. Three hours of a day spent in public transport doesn’t seem much. I know of people who commute into bigger cities with a car – five hours per day. However, I started to accumulate weight. More weight than I would love to have. When this job ended I was rocking more than 90 kg or 200 pounds. Try to run for more than one hour with this weight. I works, but it is not a refreshing experience. 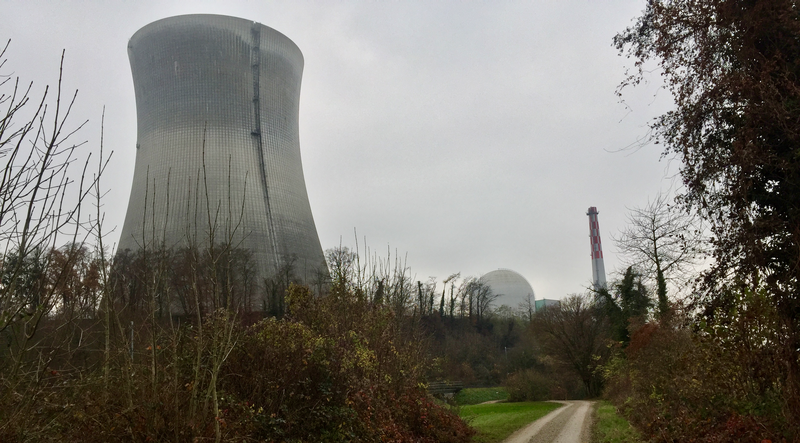 Nuclear power plant on the Rhine. Therefore I slowly started to exercise more and I started to run training marathons. To the point where I was doing more than one marathon per week. There is a signaled marathon route around Zurich and although it is called “the green route” you will see some of the biggest traffic infrastructure in and around Zurich. Needles to say this route is 50 % concrete and asphalt. I had time at hand, which helps a lot. I further refined my walking abilities by doing strolls around the lake here and nearly in entire Switzerland. The long-distance paths we have here are however something for people who hate themselves. Most of them were planed in the tourism offices, where specialists really seem to believe, hikers love to walk from town to town to enhance their shopping abilities. The idea, that somebody may walk because he loves to walk wasn’t a priority for them. Therefore I quickly found myself in the position of an unlikely hiker. I know of nobody in Switzerland who does 40 miles per day because she or he may enjoy it. A typical hiker in Switzerland often climbs up a mountain in a day hike. Retired folks do this in groups sometimes and when you are lucky enough, you may find yourself in the same train as they do. Drinking wine before eight in the morning, they are often more obnoxious than soldiers on the way to their formation. Often, when I have to cross these groups in the field, they try to be funny, making jokes on my expense. Several times I was called out because I hike with trail runners instead of their heavy leather boots. However, I began to like the experience you get when doing miles and also when in all weather conditions. I learned to hike in thick fog and in temperatures below freezing or in the heat of the summer (on asphalt, what do you think). I learned that you don’t get automatically roasted several times when there is a thunderstorm around. Most paths here date back to medieval times or are even older, nobody liked to walk on the ridge lines back then. I can walk for an entire day in rain without problems. I further learned to deal with fear when walking from Zurich to Basel. Yes, it is dark, yes you are probably surrounded by boars but after yelling at one he went back into the bushes just fine. And I learned to stay awake and continue even when I had problems walking in a straight line. You just continue and after a while your senses will be fully restored. Hiking my style puts me a least here in Switzerland in the same position as people who don’t seem to fit in the cliche of a hiker. I have a lot of sympathies for the unlikely hiker movement and a lot of respect for gentlemen like Uncle Paul from Texas. He is twice or threetime my weight but nevertheless he decided to attempt the AT. His first attempt last year failed because he got back pain after just 6 days. Sometimes it’s the journey towards a goal that improves life already. When Uncle Paul started this journey he took a lot of medication he could get rid off in the meantime. Unfortunately it is nearly impossible that he will finish the entire AT anytime soon. The only people I have a problem with are those who try to leave wrong impressions. In their videos the AT is always super dangerous and you risk to get eaten alive by a bear, if you manage not to die because of all the snakes that hunt you for miles. Often these are older gentlemen who brag about their everything Zpacks gear. And who stop to publish videos only two hundert miles in. Featured image: Rhine Valley, near Lake Constance. One of my first training hikes.